Unconscious Incompetency- You don’t know that you don’t know how to do the skill. Proper application of the skill is next to impossible. Conscious Incompetency- You know how to do the skill, you just can’t yet. Conscious Competency- You know how to do the skill but you have to actively think about it to properly apply it. Unconscious Competency- You have internalized the skill and ingrained it into muscle memory. Using this paradigm, we can analyze our own ability. For instance, a person who does not know the four cardinal rules of firearm safety would clearly be in the first stage. A person who know the rules but cannot apply them would be in the second stage. A person who knows the rules but can only apply them consistently with active conscious thought would be in stage three. Finally, a person who can put the rules into their own words and apply them consistently regardless of distractions would be in the fourth stage. Using this framework, let’s dive into the obvious (and not so obvious) issues with each stage. We all understand that failure to consistently and rigidly apply firearm safety can end up in tragedy. If you have not sought out professional guidance in firearm handling, I guarantee you are somewhere in the first two stages. Operating a tool such as a firearm in these stages is akin to drunk driving. If you have participated in formal training sessions but haven’t progressed that education with personal practice, you are more than likely in stage three. The problem with stage three is associated with a core psychological fact, humans cannot parallel process. We can’t do math and English homework concurrently. What humans are adept at is task switching. This means we can rapidly switch between tasks almost seamlessly. Issues arise however when a particular task overrides our switching instinct and forces us to task fixate. Once we task fixate all other tasks cease temporarily in our mind. Translated into firearms safety, we commonly see people with good finger and muzzle discipline turn to talk with a neighbor or bend down to pick up a piece of ammunition and muzzle themselves and other people. The stopped task switching and focused on something else. This caused them to forget about the pistol in their hand and violate a cardinal rule of safety. If you have participated in regularly scheduled training sessions and spent a couple hours a week at home practicing, you are probably in the last stage. Now, before you sit back in your chair and softy congratulate yourself, realize that this is a perishable skill. It requires regular upkeep to maintain. If you let it lapse and fall below the threshold, tragedy is just around the bend. You have to continue practicing safety. Here’s how. Rule 1: All guns are loaded, All the time, Even if they’re not. This rule seems easy to understand but we see egregious errors on a daily basis. This rule needs to be taken absolutely literally. It does not matter that the magazine is out. It does not matter that the slide is locked to the rear. Treat it as if it is ready to go. Playing the role of the “expert” who “knows” the condition of the firearm is a dangerous gamble. Humans are creatures of routine and habit. If you make the distinction between how to treat a loaded gun versus an unloaded gun, you will one day make a mistake and be treating a lethal tool as a benign object. We have to establish an appropriate and effective procedure that we can train into a habit. My procedure goes like this. EVERY time I am about to touch a gun, I ask myself three questions. This rule is the most commonly broken for two reasons. First, firearms are ergonomically designed to make it natural for your finger to rest on the trigger. This means that you instinctively want to put your finger there. Second, people do not have a consistent finger position that is appropriately high. To fix these issues, we must find a register position that we actively seek out and find every time we are operating the firearm. A register position is any physical or tactile cue that our finger can detect easily. Register positions MUST be well above the trigger guard along the slide and frame. Register positions MUST be slightly uncomfortable. The more uncomfortable our register position is, the less likely we will be to forget where our finger is (remember task fixation?). Once we’ve found our register position, we can begin practicing. This rule is commonly violated due to task fixation. Focusing on the operation of the gun or your cell phone ringing will inevitably lead to you muzzling something you would not want destroyed. We’ve seen people point guns at their hands as they’re trying to load the firearm, their heads as they check their target, their neighbors as they look at the gun, and their feet as they put the gun in a bag. You must have constant conscious awareness of your muzzle. If something becomes more pressing than the gun in your hand, you need to set it down until you are ready to focus on it again. Here’s how I practice muzzle awareness. This drill not only allows you to practice task switching with the firearm but you also get lots of finger discipline practice! Bullets go through things. They go through people, animals, doors, cars, and windows. This is true regardless of the type of projectile you are using. We cannot press a trigger unless we are A. absolutely sure it needs to be shot and B. sure that the bullet will come to rest in a safe area. You are responsible for every bullet that leaves your barrel regardless of circumstances. Keep a flashlight with your defensive gun and analyze your environment before you press that trigger. One of the best ways to practice this rule is to participate in monthly IDPA matches. This will increase you general ability level but also get you used to thinking before acting under time stressors. In a normal IDPA match, there are “shoot” targets and “no-shoot”. The “no-shoot” targets are often put behind the “shoot” targets to force a shooter to alter their angle of fire before shooting. If they do not, their bullet will pass through the acceptable target into the unacceptable target. The result is a large time penalty and friendly ridicule from other shooters. As with anything in the firearm training world, this article has barely begun to scratch the surface. Being capable and adept at safety takes formal training and coaching as well as dedication from the student to hone their skills individually. You only have three options when traveling the road to safety: Tragedy, Embarrassment, and Practice. Let’s all agree to learn from the latter. 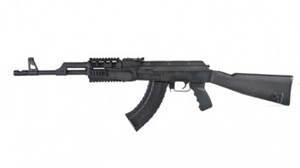 We will be receiving in a week from Century Arms International some AK 47’s in two laminate wood style’s Black, Brown, and also a synthetic Tactical style all three come with milled receivers not stamped like most AK’s today. We sold out of them in less than a week so we’ve had a chance to bring them back in. Get them while you can! ALL MADE IN THE USA in their Vermont facility machined from a solid 11 lb. block of 4140 ordnance quality steel and trusted by shooters around the world! Comes with two 30 rd. magazines and a 1 year manufacturer’s warranty!